Hoxton Gin, if it were to be personified in a film, would be that kid who was born into a family of car salesman. Great grandfather sold Fords; Grandpa sold Fords; and his father sold his first Mustang a month before he could drive one. Undeterred by the specter of the family business hanging over his head and ten tons of expectations, the kid decides he wants to be a banker, an artist, a poet, or whatever. Its not the what that matters so much as the fact that he does something with his family name (still renowned for their cars) that’s as far from the auto lot as possible. Ladies and Gentleman, meet Mr. Hoxton. Hoxton gin that is. Its reputation surely precedes it. I knew about this divisive spirit* long before I’d ever had a chance to taste it. There’s been many posts and impromptu twitter conversations that can be summed up in two words: “really? Conconut! ?” To be fair, Hoxton doesn’t shy away from this. Their bottle warns you right from the outset. If you don’t like coconut and grapefruit, then you should stay away. Bold and perfumed on the nose. 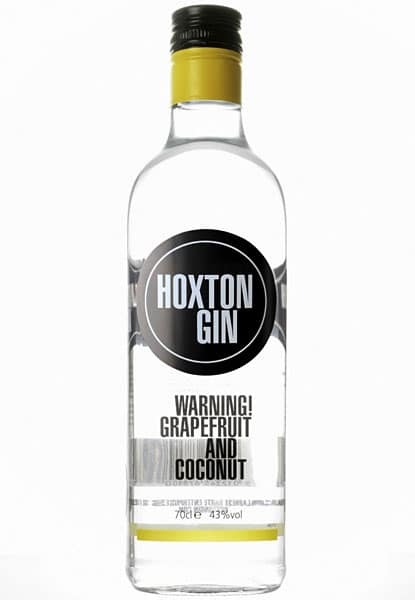 Hoxton Gin definitely smells like a coconut rum, with a strong, deeply overpowering coconut bouquet. Now I won’t ponder the coconut rum angle any further, because others have done it quite well already (spoiler: it doesn’t taste like rum). It smells smooth and inviting. Hardly a hint of juniper, and very little on the nose would give it away as being a gin. A little harsh at first, particularly surprising at 86 proof, but comes on strong with an intense coconut and citrus note. Definitely overtones of grapefruit, but quickly gives way to the tail which is where a bit of ginger and juniper jump out. The finish isn’t in line with some other boutique gins in terms of a dry juniper on the palette, but there is a drying sensation in there. At the very end, long after the sip, hints of juniper and grapefruit remain. I had Hoxton Gin in a Hoxton and Tonic and I came away somewhat surprised. The harsh edge was taken off by the tonic, and the quinine complemented and offered a counterpoint to the overpowering coconut notes at the front. All in all, it didn’t taste a ton like a gin and tonic. But you know what it? It wasn’t bad, it was actually rather good and quite refreshing. I came away somewhat impressed. There’s a lot of snark out there about Hoxton Gin, but its not categorically bad. It has some redeeming qualities, and without resorting to desperate experimentation (as other writers have suggested as the only way to make good use of this spirit) I found that a Gin and Tonic does it justice. Will it appeal to the average gin fanatic? I’d lean towards no. But for those who don’t mind an unusual edge to their gins, I think they might find a willing dance partner. I for example didn’t find the qualities any more extreme than G’vine’s Floraison for example. It was a deviation for sure and took some bold risks. But it isn’t a failure. Its just rather different. So perhaps this is where its hard to write an authoritative review off one cocktail and one shot served neat. But you know what? I’d be willing to have it again, and I’d be willing to experiment with it. I’m going to say it, it can be pretty good. Takes some risks, and none more notable than putting juniper in the back seat. Despite the Coconut predominating, I think Hoxton Gin works in some unusual ways. If you don’t like Coconut, you’re not going to like this. But its really not any more unusual than offerings from Glorious Gin or G’vine. Give it a fair shake, you might be surprised. Thanks to David over at Summer Fruit Cup for helping make this tasting possible. Because the bottles are small sample bottles, this review is not as thorough as my normal gin reviews. There’s only enough for some tasting neat and no more than one normal-sized cocktail. Although I do my best to give as full of a review as possible, complete with ratings, the tasting is not as complete as I would normally want to do. *Though I say its divisive, what I really mean is that most bloggers and bartenders have been rather negative in their characterization of the spirit. Hi, this is a very well structured and unlike your typical opinion dominated review is very well approached and well considered. You clearly took the time to understand the product and what it is trying to achieve as an offering to introduce more gin drinkers to the category. A gateway product. My brother is the creator, it’s our company and I’d love to tell you more, not to mention I have some fantastic recipes with Hoxton for the drinks you mention. Email me at jon@hoxtongin.com and I’ll send you them over. I really enjoyed this gin and took a bottle to my friend in Canada when I visited in March this year. Both her and another friend found this gin to be very refreshing. Unfortunately it appears that Sainsbury’s will no longer be selling it which leaves me at a loss as to where I can purchase it. I also informed a few friends who are gin drinkers about this drink prior to xmas and they bought it and liked it. It’s such a unique gin, and I think it has an unfair bad rap. I’m glad to hear you liked it but it sure does seem to be getting harder and harder to find….